Adolescent had the pleasure of attending of what we believe is one of the most impactful events held at Junior High Gallery in Los Angeles, CA- Cosmic Not Exotic: an exhibition of work by women of color confronting racial fetishism. 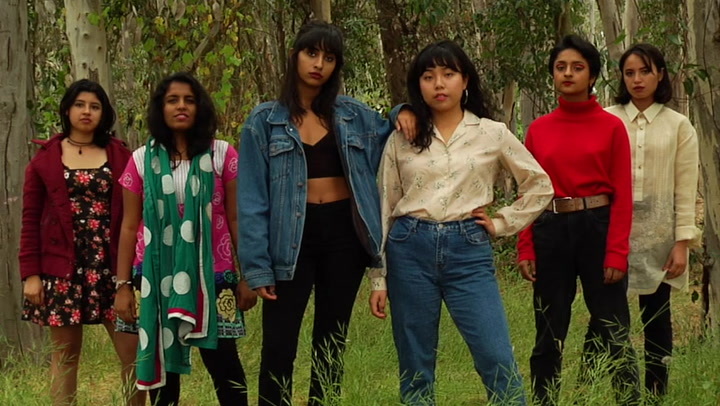 Featuring the visual projects of WOC collective "Nobody's Betis,” Comic Not Exotic intends to redefine the fetishization of women of color and help them reclaim their cultural identity. It showcases the collaborative efforts of WOC and the strength in unity. We fell in love with the work we saw and got to interview the driving mind behind Cosmic Not Exotic, Samar Saif. @: Hi Samar, can you tell us a little bit about yourself? My name is Samar Saif and I am a South Asian Muslim woman who founded the multimedia collective centered on activism for women of color called "Nobody's Betis". In my culture the word “beti” has many different meanings in Urdu but centers around creating roles for females to follow. I wanted to call this collective Nobody’s Betis because I believe that the roles this word assigns should not define us. Growing up amongst very stringent gender roles and beliefs surrounding what a Pakistani Muslim woman meant, I wanted to reclaim my own heritage for myself and create a space for other women of color to feel comfortable and explore their identities as well. @: What is Cosmic Not Exotic? Can you tell us about the exhibit? Cosmic Not Exotic arose from the word exotic. I have been called exotic by men before and was meant to take it as a compliment, even though "exotic" is a word used to describe plants and animals. As I shared my experience with this word, I realized that many other women of color have also been called this and how dehumanizing it is. It made me feel like I was abnormal and inhuman and I realized that other women also felt these feelings of otherness when it came to this word. For this reason, I called the art show Cosmic Not Exotic because when women of color come together and share their energies and talent, it creates something beautiful and cosmic. I wanted women of color to feel this beautiful energy instead of the isolating feelings that stem from being called exotic. I wanted to further the idea of bringing together the energies of women of color and I created the exhibit to also create the space for this to happen. Finding exhibits showcasing women of color by women of color is something that I have rarely been able to experience and I think it is so important especially now for us to have spaces where we can see ourselves on the wall and read and watch things we can relate to. I created this exhibit for every woman of color who has felt isolated in her own skin. I know how hard it is to feel like you don’t belong and that you are not worthy and I wanted this exhibit to show others that we are beautiful, our pain is valid, and most of all, that we have worth. @: What inspired you to get this project/collective together? I was seeing the lack of space and representation for women of color and queer women of color. I spent a lot of high school involved in the DIY art and music scene and it was isolating for me because I realized that I never felt like anything addressed my identity or experiences. I realized my freshman year of college that if I don't create the space for myself and others, it won’t exist. I wanted to create a space and community for women of color and queer women of color so I founded the collective “Nobody's Betis”. This collective focuses on opening up a discussion space and also a space for artists to share their work. My hope for this collective is that women can come and share their fears, hopes, desires, and things that they create in a space where they feel welcome and comfortable. Racial fetishism is a topic that has impacted my life. I realized that this is an issue that I wanted to create projects that showcase the ways in which our identities diverge but also the different things that bring us together as well. The visual project this year focused on the topic of the racial fetishism that women of color face. The photo project focused on redefining what women of color are fetishized for and reclaiming their cultural identity and ethnicity by showing their strength and combating the idealization and sexualization of their beings. I also wanted to include written pieces because I thought it was important to share the words of the women involved. For the short film, I wanted to bring together women of color again and showcase our strengths and voices through documenting our joys, angers, and pain and how even through all of these we are stronger together. The film still has aspects about racial fetishism but I really wanted it to be more about empowerment and strength. @: Who were the artists involved? Can you tell us a little bit about everybody who made this project happen? The artists involved were all women of color who so kindly and bravely gave me their time and words and allowed for their stories to be shared. Some of the women were my close friends and others I did not know well, but by the end of us sharing time together, it brought us closer. The written pieces were by Antonia Lorenzo, Emily Butler, Avery Robinson, Raquel Cisneros, Alyssa Galvan, and myself (Samar Saif). Also Abra Olivier, Kasey O'Connor, Pooja Ekbote, and Sanskruti Kakaria who participated in the visual photos on racial fetishism who my close friend Hunter Ivanjack kindly helped take. Emily Liu also contributed pieces from her zine on racial fetishism. For the video, Piece 1: Avery Robinson, Piece 2: Samar Saif, Piece 3: Antonia Lorenzo, Piece 4: Vaishnavi Paudel, and Piece 5: Sanskruti Kakaria. And the models: Soni Bhalla, Emily Liu, Alyssa Galvan, Samar Saif, Antonia Lorenzo, Vaishnavi Paudel, Sanskruti Kakaria, and Raquel Cisneros. Elliot Lockwood helped film and edit the video. All of the women involved are doing their own incredible work, including my friend Emily Butler who is creating her first short film. I highly recommend reaching out to any of these women or following their endeavours because they are all wonderful and incredible beings. @: What message do you want to leave us with? I want to leave everyone with the message that as women of color and people of color, sometimes existing in this world feels like we are invisible. So many moments in myself I have felt my voice silenced and isolated in situations and because of this, I created the space and collective for myself and others so we can have moments and a community so we don’t have to feel like this. I want my exihibit to leave people with the message that these micro-aggressions are harmful when it comes to racial fetishism and this is a real issue and we feel real pain. I also want to leave the message that I want more spaces like this to be created for women of color and people of color because we deserve it. I am here to help and I want this to not be the last women of color art show run by a woman of color. We are worthy and we do not deserve to be silenced. Our pain is valid and we are valued.